In ancient Chinese society, most emperors respected the scholars and were affected by their philosophy. Doctors were not regarded highly because they made their diagnosis by touching the patient's body, which was considered characteristic of the lower classes in society. In ancient Chinese society, most emperors respected the scholars and were affected by their philosophy. Doctors were not regarded highly because they made their diagnosis by touching the patient's body, which was considered characteristic of the lower classes in society. Although the doctors developed a profound and successful medical science, they were commonly looked down on. However, they continued to work hard and study, and quietly passed down the results of their research to following generations. Of all the groups studying qigong in China, the doctors have been at it the longest. Since the discovery of qi circulation in the human body about four thousand years ago, the Chinese doctors have devoted a major portion of their efforts to studying the behavior of qi. Their efforts resulted in acupuncture, acupressure or cavity press massage, and herbal treatment. In addition, many Chinese doctors used their medical knowledge to create different sets of qigong exercises either for maintaining health or for curing specific illnesses. Chinese medical doctors believed that doing only sitting or still meditation to regulate the body, mind, and breathing as the scholars did was not enough to cure sickness. They believed that in order to increase the qi circulation, you must move. Although a calm and peaceful mind was important for health, exercising the body was more important. They learned through their medical practice that people who exercised properly got sick less often, and their bodies degenerated less quickly than was the case with people who just sat around. They also realized that specific body movements could increase the qi circulation in specific organs. They reasoned from this that these exercises could also be used to treat specific illnesses and to restore the normal functioning of these organs. Some of these movements are similar to the way in which certain animals move. It is clear that in order for an animal to survive in the wild, it must have an instinct for how to protect its body. Part of this instinct is concerned with how to build up its qi, and how to keep its qi from being lost. We humans have lost many of these instincts over the years that we have been separating ourselves from nature. Many doctors developed qigong exercises which were modeled after animal movements to maintain health and cure sickness. A typical, well-known set of such exercises is Five Animal Sports (Wu Qin Xi, 五禽戲), created by Dr. Jun Qing (君倩) and later modified and publicized by the well-known medical qigong doctor, Hua Tuo (華佗) during the Chinese Three Kingdoms Period (三國) (A.D. 221-265). Another famous set, based on similar principles, is called the Eight Pieces of Brocade (Ba Duan Jin,八段錦), and was created by Marshal Yue Fei (岳飛) during the Chinese Southern Song Dynasty (南宋) (A.D. 1127-1280). Interestingly enough, Yue Fei was a soldier rather than a doctor. In addition, using their medical knowledge of qi circulation, Chinese doctors researched until they found which movements could help cure particular illnesses and health problems. Not surprisingly, many of these movements were not unlike the ones used to maintain health, since many illnesses are caused by unbalanced qi. When an imbalance continues for a long period of time, the organs will be affected and may be physically damaged. This is like running a machine without supplying the proper electrical current, over time the machine will be damaged. Chinese doctors believe that before physical damage to an organ shows up in a patient's body, there is first an abnormality in the qi balance and circulation. Abnormal qi circulation is the very beginning of illness and organ damage. When qi is too positive (yang) or too negative (yin) in a specific organ's qi channel, your physical organ is beginning to suffer damage. If you do not correct the qi circulation, that organ will malfunction or degenerate. The best way to heal someone is to adjust and balance the qi even before there is any physical problem. Therefore, correcting or improving the normal qi circulation is the major goal of acupuncture or acupressure treatments. Herbs and special diets are also considered important treatments in regulating the qi in the body. As long as the illness is limited to the level of qi stagnation and there is no physical organ damage, the qigong exercises used for maintaining health can be used to readjust the qi circulation and treat the problem. However, if the sickness is already so serious that the physical organs have started to fail, then the situation has become critical and a specific treatment is necessary. The treatment can be acupuncture, herbs, or even an operation, as well as specific qigong exercises designed to speed up the healing or even to cure the sickness. For example, ulcers and asthma can often be cured or helped by some simple exercises. Recently in both mainland China and Taiwan, certain qigong exercises have been shown to be effective in treating certain kinds of cancer. Over the thousands of years of observing nature and themselves, some qigong practitioners went even deeper. They realized that the body's qi circulation changes with the seasons and that it is a good idea to help the body out during these periodic adjustments. They noticed also that in each season different organs have characteristic problems. For example, at the beginning of fall, your lungs have to adapt to the colder air you are breathing. While this adjustment is going on, the lungs are susceptible to disturbance, so your lungs may feel uncomfortable and you may catch colds easily. Your digestive system is also affected during seasonal changes. Your appetite may increase, or you may have diarrhea. When the temperature goes down, your kidneys and bladder will start to give you trouble. For example, because the kidneys are stressed, you may feel pain in your back. Focusing on these seasonal qi disorders, the meditators created a set of movements that can be used to speed up the body's adjustment. These qigong exercises are commonly called "four seasons gong" (si ji gong, 四季功). Chinese martial qigong was probably not developed until Da Mo (達磨) wrote the Muscle/Tendon Changing Classic in the Shaolin Temple during the Liang Dynasty (梁) (A.D. 502-557). When Shaolin monks trained Da Mo's Muscle/Tendon Changing Qigong, they found that they could not only improve their health but also greatly increase the power of their martial techniques. Since then, by following Da Mo's qigong theories and concepts, many martial styles have developed qigong sets to increase their effectiveness. In addition, many martial styles have been created based on qigong theory. Martial artists have played a major role in Chinese qigong society. When qigong theory was first applied to the martial arts, it was used to increase the power and efficiency of the muscles. The theory is very simple—the mind (yi) is used to lead qi to the muscles to energize them so that they function more efficiently. The average person generally uses his muscles at about 40 percent maximum efficiency. But if he can train his concentration and use his strong yi (the mind generated from clear thinking) to lead qi to the muscles effectively, then he can energize the muscles to a higher level and therefore, increase his fighting effectiveness. As acupuncture theory became better understood, fighting techniques were able to reach even more advanced levels. Martial artists learned to attack specific areas, such as vital acupuncture cavities, to disturb the enemy's qi flow and create imbalances that cause injury or even death. In order to do this, the practitioner must understand the route and timing of the qi circulation in the human body. He also has to train so that he can strike the cavities accurately and to the correct depth. These cavity strike techniques are called pointing cavities (dian xue, 點穴) or pointing vessels (dian mai, 點脈). Since the 6th century, many martial styles have been created that were based on qigong theory. They can be roughly divided into external and internal styles. The external styles emphasize building qi in the limbs to coordinate with the physical martial techniques. They follow the theory of wai dan (external elixir) qigong, which usually generates qi in the limbs through special exercises. The concentrated mind is used during the exercises to energize the qi. This increases muscular strength significantly and therefore increases the effectiveness of the martial techniques. Qigong can also be used to train the body to resist punches and kicks. In this training, qi is led to energize the skin and the muscles, enabling them to resist a blow without injury. This training is commonly called "iron shirt" (tie bu shan, 鐵布衫) or "golden bell cover" (jin zhong zhao, 金鐘罩). The martial styles that use wai dan qigong training are normally called external styles (wai jia, 外家) or hard qigong training that is called hard gong (ying gong, 硬功). Shaolin Gongfu is a typical example of a style that uses wai dan martial qigong. Although wai dan qigong can help the martial artist increase his power, there is a disadvantage. Because wai dan qigong emphasizes training the external muscles, it can cause over-development. This can cause a problem called "energy dispersion" (san gong, 散功) when the practitioner gets older. In order to remedy this, when an external martial artist reaches a high level of external qigong training he will start training internal qigong, which specializes in curing the energy dispersion problem. That is why it is said: "Shaolin Gongfu from external to internal." Several internal martial styles were created in the Wudang (武當山) and Emei (峨嵋山) mountains. 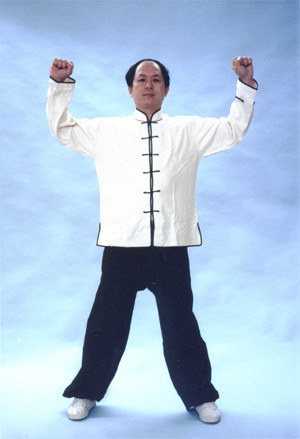 Popular styles are Taijiquan, Baguazhang, Liu He Ba Fa, and Xingyiquan. However, you should understand that even the internal martial styles, which are commonly called soft styles, must on some occasions use muscular strength while fighting. That means in order to have strong power in the fight; the qi must be led to the muscular body and manifested externally. Therefore, once an internal martial artist has achieved a degree of competence in internal qigong, he or she should also learn how to use harder, more external techniques. That is why it is said: "The internal styles are from soft to hard."